Lama Zopa Rinpoche during the long life puja offered in Bodhgaya, India, January 2012. 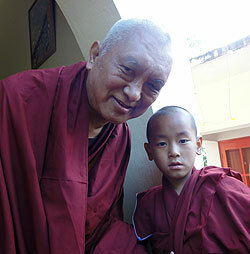 Lama Zopa Rinpoche and the young incarnation of Ribur Rinpoche, Bodhgaya, India, January 2012. 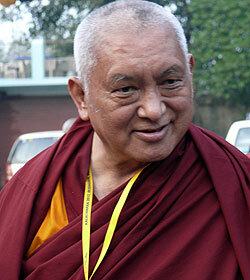 Rinpoche’s health continues to improve. Rinpoche has more movement in his right hand and is now more able to walk without assistance. Rinpoche is in Nepal and continuing to focus on physical therapy and a few various other methods, always incorporating them as a means to collect merit and purify, such as doing his physical therapy while chanting mantras or walking around holy objects. “It is said in the teachings that morality is like the earth for the running and the non-running.1 The Buddha taught that morality is the support and foundation for all good qualities. Keeping extremely pure morality is very important. This is the root of the Buddha’s teachings. There’s great benefit if we maintain and protect our morality well but there are many shortcomings if we do not. If the activities of the Vinaya such as the so-jong, gar-nä and yar-nä3 are not practiced, the teachings are not Buddhadharma and the holy Dharma has degenerated. Even the existence of bodhisattvas with high tantric realizations doesn’t meet the definition for the existence of the teachings of Buddha. Therefore, the Buddha said in the Pratimoksha Sutra, “When I pass into the sorrowless state, morality will be your Buddha.” He meant that after his passing, the morality in our mental continuum would be his regent. Thinking in this way, we must preserve the Vinaya, our morality. Anyone who renounces the householder’s life (rabtu chungna) living in the ordination to achieve liberation from the oceans of samsaric suffering, protect those who have taken this vow (rab-jung). Why? Because even one lay person who every day for hundreds of years collects extensive merit cannot compare with the merit created by somebody who has renounced the householder’s life and lives in the vow of the teachings for just one day. The person living in the vows collects unbelievably far greater merit than the other person. There’s no comparison. 1 Running means sentient beings; non-running means the earth. 3 The Sangha confession ceremony, the rains retreat and the conclusion of the rains retreat. 4 This is the Swayambhunath stupa, not the one we see on top but the crystal stupa inside the mountain that was not made by people. Osel, his girlfriend, Mai, and brother Kunkhyen spending time with Lama Zopa Rinpoche at Root Institute, India, January 2012. Rinpoche gave an impromptu one-hour teaching outside the prayer wheel at Root Institute, India in December 2011 – watch it freely on the FPMT Online Learning Center. “… After the Kalachakra initiation was finished, over about eight days Lama Zopa Rinpoche received a set of initiations from Dhakpa Rinpoche here at Root Institute. Rinpoche insisted on leading all the prayers and pujas as well as the long life puja offered to Dhakpa Rinpoche. Rinpoche fearlessly takes on all these things regardless of concerns about health, etc. International Office warmly welcomes George as our new Director of Operations. George will be responsible for the day to day running of the office and overseeing and developing revenue sources for International Office. George’s professional background is in law – he practiced law as an associate, junior partner and senior partner in one of Miami, USA’s largest law firms, and was the director of the firm’s appellate department. In 1986, George opened his own office in Florida, USA where he practiced law until joining FPMT International Office. George has served as a legal advisor to several Buddhist organizations in the United States during the past 20 years, including Deer Park Buddhist Center, and FPMT International Office is delighted to have his experience and skill to help with FPMT’s development. George began studying Buddhism while he was an undergraduate student at the University of Illinois. After attending the first Kalachakra initiation offered by His Holiness the Dalai Lama in the West in July of 1981 at Deer Park Buddhist Center, George focused his studies on Tibetan Buddhism. At Deer Park Buddhist Center George was able to receive Dharma instructions from many renowned Tibetan teachers including Geshe Sopa Rinpoche and Lama Zopa Rinpoche, among others. Please rejoice in the new bread-making machine in the Sera Je Food Fund kitchen at Sera Je Monastery. This offering was generously sponsored by Cherok Lama on the occasion of his debate held as part of the preparation for his geshe examinations in August last year. The introduction of this bread-making machine will reduce the current kitchen helpers (who are all monks studying in the monastery) by 50%, meaning that these monks will have more time for their philosophical studies and practices. Please enjoy this short video of the bread-making machine in action. On the first day it managed to produce more than 800 loaves of bread for the day’s lunch in two hours, and again in the afternoon, 1,200 loaves of bread for next day’s breakfast! This is a great improvement for the Sera Je Food Fund kitchen. Thank you to all the kind benefactors who support this amazing project and please rejoice in this incredible offering that we are able to make to the Sangha. A heartfelt thank you to everyone who has submitted their International Merit Box Project donation for 2011. There is still time to send in your donation before collection ends on March 31, 2012. You may make a credit card donation though the Virtual Merit Box or see our collection information page for more options. Basic Program: During the introductory week this January of the first university-accredited FPMT Basic Program at Istituto Lama Tzong Khapa (ILTK) in Italy, Professor Massimo Bergamasco, an ILTK student and instigator of this significant development, hosted a very inspiring and interesting visit to the prestigious university which is accrediting this BP – the University of Pisa’s Scuola Superiore Sant’Anna. ILTK’s BP students were encouraged to participate in the interesting weekend seminars that will be on offer there during their two years of BP. The English on-line version of the program, taught by BP graduate Ven. Kevin Middleton, is university-accredited as well. The residential BP subjects will be taught by several different FPMT-registered teachers, including Dagri Rinpoche and Masters Program graduate Glen Svensson. We have been preparing major conversions to be able to provide all published works in e-reader format, including the reformatting of the first volume of Vajrayogini Manual, as well as stand-alone versions of all sadhanas and associated practices. Final edits are being made to a Lama Chöpa audio program chanted by Ven. Dechen. A new protection from Lama Zopa Rinpoche specifically to increase success and prosperity, Wheel of the Meritorious Elephant Generating Power, is being developed into cards and posters. We’re also creating a centralized database of all ongoing and pending FPMT Education Services projects which will help materials be produced more efficiently. We are currently coordinating with Nalanda Monastery, France to host Foundation and Rituals Trainings later this year. Mandala has added new features to its website! In addition to finding the online stories from our most recent issue, Mandala offers readers new blog posts daily as well as thousands of archive articles. Visit our homepage and find links to the latest new posting. Searching for an article on a specific topic? Check out our tag cloud, where you can access the tags we have added to our new and archive articles, making them easier to find. From topics tagged “Australia” to “Big Love” to “Lama Zopa Rinpoche” – just to name a few – Mandala is organizing our site to help you discover new teachings and inspiration or simply track down an article you remember reading years ago. You can find all this at fpmt.org/mandala. Lama Zopa Rinpoche at Root Institute, India, January 2012. “We can see how most fortunate we are, ourselves working for the center, all the members who are working for the center, no question. Then even the people coming to study. Of course we are even more fortunate, because [we are] working, causing sentient beings to meet Dharma: so what you’re doing is more fortunate, the most important thing, to benefit sentient beings. The most important thing is to benefit sentient beings. What they really need, what they want is happiness, what they don’t want is suffering. What they do not like is suffering, but due to ignorance they constantly run, constantly keep busy creating suffering, due to ignorance. What they like is happiness, but they constantly destroy the cause of happiness, as the Bodhicharyavatara says. The nature of sentient being is like that, you see. They’re afraid to learn the cause of happiness. Do you understand? They’re afraid to learn the cause of happiness. They’re afraid to learn Dharma. They’re afraid to hear Dharma. They’re afraid to learn the cause of happiness; that’s what the reality is. They’re afraid to learn the cause of happiness! They’re afraid to come to know the cause of happiness. It’s really amazing, wow. 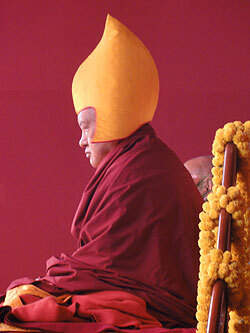 Go to Rinpoche’s Advice in the FPMT Affiliates Area and to Rinpoche’s Online Advice Book at Lama Yeshe Wisdom Archive for more advice for those offering service in the Foundation. We are accepting applications for International Merit Box Project grants until March 31, 2012. Any center, project, service, or study group that has an eligible project may e-mail meritbox@fpmt.org to request an application. Some examples: Mahamudra Centre, New Zealand is looking for a vegetarian cook and a housekeeper; Kurukulla Center, USA has a house staff position available.